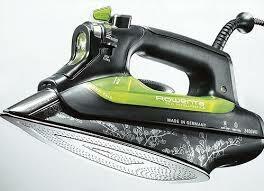 The Porsche of Steam Irons: Rowenta Eco-Intelligent. Vroom. I often wish I was this creative when finding holiday or birthday gifts. A couple years ago, I received a Rowenta Eco-Intelligent Iron as a present, and I can safely say this has been one of my all time favourite gifts ever. You might think this is an odd thing for a guy to be saying. The bottom-line is that I wear suits daily, and taking shirts to the dry-cleaners after one wear is a pain and unnecessarily expensive. They are just wrinkled (well, not after a hot steamy summer day – in that case, yes, they are going to the dry cleaners after one wear). Further, constant dry cleaning will tend to fray and damage shirts, so when you have a few expensive ones, you really want to maximize the longevity of your “investment”. A really good steam iron is one way to save money and keep looking well put-together. No-one wants to look like they slept in their clothes. The Rowenta Eco-Intelligent Iron is the “Porsche” of steam irons. The iron generally received good reviews. The construction and design of this unit is fantastic. It’s very well made and solid. The iron produces a good amount of steam that is excellent for getting wrinkles out of cotton or blend shirts. It releases an appropriate amount of steam to get the wrinkles out of cotton easily. And, it heats up fast and even. It has a pointed tip that makes navigating buttons and tricky parts of your shirts easier. The iron is comfortable to hold and maneuver. I have never experienced any water leaking from the iron, which sometimes happens with cheaper irons. There is nothing fancy here, like digital displays or retractable cords – only what is needed for the task at hand. It is easy to refill and comes with a refilling cup with spout – I have never felt frustrated by getting the water into the iron. I just never imagined myself getting excited about a steam iron. Seriously. The “Porsche” of Steam Irons. Cheaper than an actual Porsche, too. The bottom-line: The Rowenta Eco-Intelligent Iron is a surprising favourite of mine that performs well and helps save dry cleaning dollars.